S.A.F.E. Structure Designs LLC, the global leader specializing in the custom design, engineering, and manufacturing of safety first ergonomic aircraft access platforms, fall protection platforms, and maintenance support equipment, has announced its agreement with Eidos Ergonomics to offer seating products to the aviation industry under the S.A.F.E. Structure brand name. 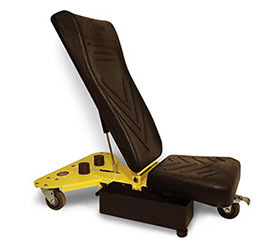 Eidos is the industry’s leading manufacturer in ergonomic industrial and utility seating for aircraft mechanics that allow the greatest physical control and comfort during maintenance. Such top-of-the-line products specifically designed to optimize safety and efficiency relative to a mechanic’s working environment further compliments S.A.F.E.’s mission to solely offer ergonomic, solution-driven products.All of S.A.F.E.’s products will therefore continue to guarantee increased productivity for mechanics with less interruptions, decreased work related injuries and workers’ compensation costs for its customers.